Do you know how to read a nutrition facts label? At their best, nutrition facts labels are helpful. They provide information about the macronutrient content of a food (i.e., the types of nutrients required in large amounts in the diet) including fat, protein, and carbohydrates. However, knowledge is not always power. You may feel overwhelmed by the information on a nutrition facts label. How much fat is too much? What is the highest amount of sugar you should have in a food? You may try to form rules about the nutrition facts label in order to label foods as “good” and “bad,” simplifying your grocery shopping experience. The problem with this is that whenever you romanticize one area and demonize another, food manufacturers catch on and work in certain “tricks.” For instance, low-fat peanut butter usually contains more sugar than the regular variety, resulting in the same number of calories per serving yet causing a higher blood sugar spike then if you had just eaten the full-fat version. This can be incredibly frustrating for consumers. You can, however, use the nutrition facts label of a food not to label the food “good” or “bad,” but rather, to help you understand how the food will act in your body. 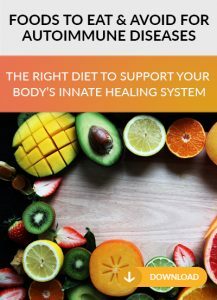 By considering the label a source of useful information rather than a halo or dunce cap, you can be empowered to understand the effects of your food choices on your body. Food labels start with a disclosure of total calories. You will notice that these are listed in “calories per serving,” rather than “calories per whole package.” Check the serving size—this number stands for the total calories in that amount of food or beverage. A calorie is not good or bad. It is just another word for energy. Your body requires energy each day in order to perform your most basic bodily functions. You can easily estimate your own daily caloric needs by using an online total daily energy expenditure calculator. Consuming fewer calories than your daily requirement results in weight loss, while consuming calories in excess of your daily expenditure results in weight gain. So, if your goal is to lose weight, should you choose foods with fewer calories? Yes, probably. If weight loss is your goal you need to consume less ‘energy’ than you body needs at any given meal or snack so your body will go to the fat stores for energy, stored fat. Read on to understand how each macronutrient functions in the body and affects your overall levels of food satisfaction. Perhaps the toughest rap for fat lies in the fact that this macronutrient has the same name that is used to describe the state of being overweight. However, eating fat does not in fact make you fat. It helps you feel satisfied. Fat provides a concentrated source of energy that does not spike blood sugar as rapidly as pure carbohydrates. 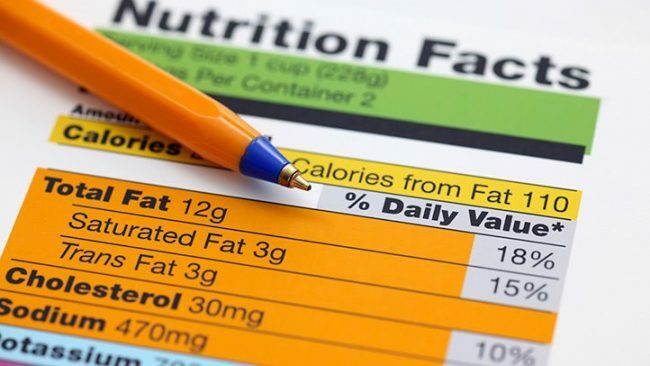 Fat is necessary to absorb fat-soluble vitamins (vitamins that only are absorbed through fat), such as vitamin D.
When looking at a nutrition facts label, you will notice that two sub-categories are listed below total fat: saturated and trans fat. Saturated fat is fat whose molecules contain double bonds between the carbons. The American Heart Association recommends limiting saturated fat, as there is a correlation between saturated fats and increased cholesterol and heart disease. Foods that contain saturated fats include red meat, poultry skins, and full-fat milk and dairy. However, recent research has contradicted the previous notion that these fats lead to heart disease. When in doubt, aim for most of your fat to come from unsaturated fats—namely nuts/seeds, avocado, olive oil, olives, and fish. Trans fat is an unnatural substance made from the chemical process of hydrogenating oils. No amount of trans fat is healthy. While trans fats naturally occur in very small amounts in some meat and dairy, modern food manufacturers add trans fats to foods in quantities that are not healthy for the human body. Most trans fat is added to food in the form of manufactured, unnatural oils to improve the shelf life. Other trans fats are used to fry foods. Whatever the case, trans fat is associated with increased risk of heart disease, some cancers, diabetes, and obesity. Avoid any added trans fats. To review—fat is healthy. You should love fat! Without fat, you would not feel satisfied by your food. Simply choose a diet moderate in saturated fat and avoid added trans fats. Carbohydrate is the food component that provides the quickest burst of energy to the body by increasing your blood sugar. Carbohydrates are a hot topic in the wellness world with low- or no-carb diets being promoted for weight loss. Educate yourself on the role of carbohydrate in the body, and make your own decisions regarding what is right for you when it comes to carbohydrate consumption. Carbohydrates cause blood sugar to rise. When blood sugar rises, the body produces insulin, a hormone that signals the body’s cells to take in blood sugar, decreasing blood-sugar levels, and bringing that sugar into the cells for use. Some degree of carbohydrate metabolism is healthy— if you consume a very low carb diet you can find yourself lacking in energy but soon your body will adapt and start to use fat for energy. However, if you consume carbohydrates in excess of your body’s energy demands, they will be stored away for later needs. Research shows that simple carbohydrate such as high fructose corn syrup, when consumed in excess, contributes to increased liver disease. Total carbohydrate (carbs, for short) refers to the total amount of carbs in one serving of that food. Total carbohydrate includes dietary fiber as well as sugars (naturally occurring and added). It delays the amount of time it takes food to leave the stomach, resulting in slower blood glucose rises and enhanced feelings of satiety. It also feeds the healthy gut bacteria, fostering healthy intestines. Fiber provides bulk to stool, contributing to regular bowel movements. The sugars in a food are a source of carbohydrate. Grams of sugar listed on the label include both naturally occurring sugars as well as sugars added to the food during manufacturing. This is fair, since the body generally processes both natural and added sugars in the same way. “Since it is a simple carb, the more sugar a food contains, typically the higher and faster blood glucose will rise after consuming that food.” A high blood-glucose increase means there will be a high insulin secretion in order to absorb the glucose from the blood. Furthermore, once insulin is produced and the sugar is absorbed, blood sugar levels drop back to baseline. A rapid rise and fall in blood sugar contributes to feelings of hunger and lethargy two to three hours post-meal. Dietary fiber is different from sugar in that it is not absorbed by the body. Instead, it eventually leaves through the stool. Since fiber is not absorbed, you can subtract the total amount of fiber from the total carb in a food. For example, if one brand of bread contains 15 g total carbohydrate per slice and 3 g fiber, it actually has 12 g absorbable carbohydrate (15 g total carb – 3 g fiber). This would be a lower carbohydrate option than an alternative brand that contains 15 g of total carbohydrate and 1 g dietary fiber, whose net carbohydrate content would be 14 g (15 g total carb – 1 g fiber) carbohydrate. Immunity: Proteins help the body to combat foreign viruses and bacteria. Messengers: Proteins help form signal relayers, such as hormones, which help the body’s systems communicate with one another. Structure: Proteins contribute to cell membranes, giving structure and support to the body’s cells and aiding in tissue repair. They also help form muscle filaments, which provide the structure of muscle mass and are also the key actors for muscle contraction. Transport: Some proteins in the body help transport atoms and molecules. For instance, the protein ferritin helps to bind and transport iron within the body. How much protein should you aim for in a meal? The jury—and science—are still out. The Dietary Recommended Intake (DRI) issued by the National Academy of Sciences, Engineering, and Medicine is .8 g per kg of body weight per day (for adults), while research published in the Journal of the International Society for Sports Nutrition cites benefits as high as 1.6 g per kg of body weight per day (also for adults). In general, it seems safe to say that adults should aim for at least .8 grams per kg of body weight per day. Protein deficiency starts at 35 grams/day or less. To find your body weight in kilograms, divide your weight in pounds by 2.2. Then multiply your weight in kilograms by 0.8 to find your minimum protein needs per day. For instance, a 135 lb woman weighs 61.4 kg (135 lb ÷ 2.2 = 61.4 kg). She should aim to consume at least 49 grams of protein daily (61.4 kg x 0.8 grams = 49 grams protein). Although not part of the nutrition facts portion of a label, the ingredients in a food provide useful information about the healthiness of that food. In the United States, any manufactured food must include a list of ingredients. Produce is not required to include a list of ingredients if it is a whole food with no added ingredients (e.g., an apple). Aim for as few ingredients as possible. The fewer ingredients, the more like a whole food that item is. Choose ingredients you recognize and can pronounce. Food additive chemicals typically contain long names that are not generally recognizable as food ingredients. When in doubt, avoid ingredients whose source you don’t recognize. Reference the allergens list if you have specific food allergies or sensitivities. By law, the common food allergens must be listed. These include milk, soy, egg, fish, shellfish, tree nuts, peanuts, and wheat. Note: Items that do not contain wheat may still contain gluten. If you are sensitive to gluten, talk to a nutritionist about how to identify and avoid gluten-containing foods. What About the Rest of the Label? You will notice that nutrition facts label contain a few other listings that we haven’t discussed, including sodium, cholesterol, and vitamins, to name a few. Aren’t these areas also important? Maybe. If you don’t have a chronic disease, you can navigate a healthy diet with just the information we’ve already covered—being mindful of macronutrient content and opting for whole foods with low numbers of ingredients when possible. If you do have a chronic disease or condition you will want to track these numbers as well. You can also enlist the help of a nutritionist. Using the above information, you can grow confidence in your ability to decipher a nutrition facts label. Remember that a healthy diet is composed primarily of whole foods and beverages that, therefore contain no nutrition facts label at all. However, for the “extra” manufactured food items that make it into your shopping cart, examine the label—namely the calories, fat, carb, protein, and ingredients—to gain an understanding of how those foods will affect your body. 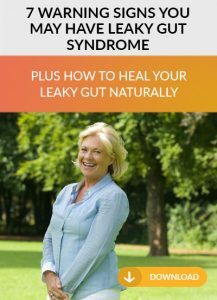 Connor Wellness Clinic was founded by Pamela Connor after her quest to heal herself was successful, and now she's helped thousands of others struggling with digestive disorders like leaky gut, SIBO, gas and bloating and autoimmune conditions. Simply schedule a free consultation with our patient coordinator at 916-404-0886 or via our online appointment scheduler.